The Concern Leadership Network (CLN) is a community of motivated leaders, advocates, and influencers who are bringing about positive and lasting change to families living in extreme poverty around the world. Our members are creative, caring, and inspiring individuals who help Concern increase awareness and raise funds. Today, meet one of our founding CLN members, Thomas Carroll. I currently work as an Elementary school music teacher at P.S 154 in Flushing, Queens where I service grades Kindergarten through 5th grade. As the music teacher, I teach general music, choir, and direct the school musical. As a music teacher, my profession is already catered to making a difference in the world through the gift of joy, artistry, and expression. I am moved by the impact music has on the lives on young people and want to continue to inspire others and give back in any way that I can. I have also been surrounded by so many incredible people who have motivated me to use my talents to make an impact on those who need it most. 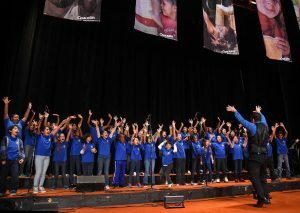 Thomas Carroll and his students performing at Concern’s Annual Seeds of Hope Dinner in 2016. Through my music program, I have untied our school concerts to educate our school community on the amazing work Concern is doing throughout the world. Our students research Concern’s projects and prepare a presentation to be displayed at the school show. Parent and community member have the opportunity to learn about the project and donate money to support the cause. It is always so amazing to watch our community come together to assist with Concern’s beautiful mission! Growing up, Concern has always been close to my heart. One of Concern’s most active board members, Joan Carroll (a.k.a. Aunt Joan), has been involved with the organization for several years. Her generosity, compassion, and enthusiasm for Concern has always been an inspiration to me. I started with participating in the Spring Run and the winter ball. Since then I have been using my talents as much as possible to assist in any way that I can. One of my most memorable experiences was when my 4th and 5th grade student choir had the opportunity to perform at the Seeds of Hope dinner at the Waldorf Astoria. 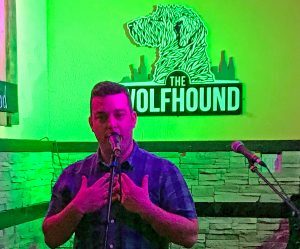 Thomas introducing musicians at the benefit concert he organized at the Wolfhound in Queens. I believe in the power of unity to influence change. It takes people of different backgrounds, occupations, and networks to truly promote and advocate for Concern’s mission. I joined the CLN because I enjoy being surrounded by like-minded people who want to lead by example and make a lasting impact on people in the poorest regions of the world. The CLN has connected me with some of the most generous and powerful people I have ever met and I look forward to meeting more as the network continues to grow! What are your goals within the CLN? My goal within the CLN is to continue to utilize my network to champion Concern’s mission. Through this, I hope to inspire others to do the same and join this fantastic group of creative and talented people. The more networks we can influence, the stronger we can become. Recently, I put together a benefit concert in Astoria, Queens, and it was a huge success! We laughed, learned, cried, and danced the night away in honor of Concern — and in doing so raised more $2500 for the organization’s life-saving efforts throughout the world. Looking into the future, I plan to produce another musical evening and will be working with another fantastic CLN member to sit it through. Stay tuned for details!